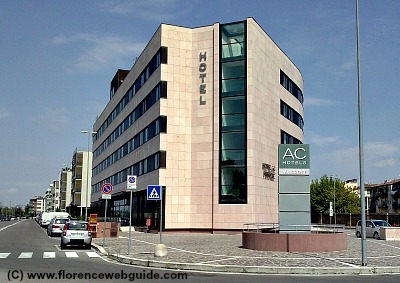 Welcome to your 4 star hotel in Florence directory! 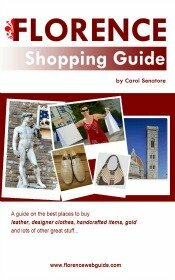 Here you will find great tips about the best four star lodging in Firenze, places you probably wouldn't be able to pick out on your own without 'knowing the ropes' in town. Luxury hotels like these provide those extra comforts that make going back to your accommodation after a long day of sightseeing a real pleasure: lounge bar, plush sofas, on-site restaurant and coffee bar, spacious rooms, and plenty of pampering by the staff. This page will help you choose your Florence lodging wisely, depending on the atmosphere you prefer, the location that best suits your needs, and those extra facilities that you just can't live without! 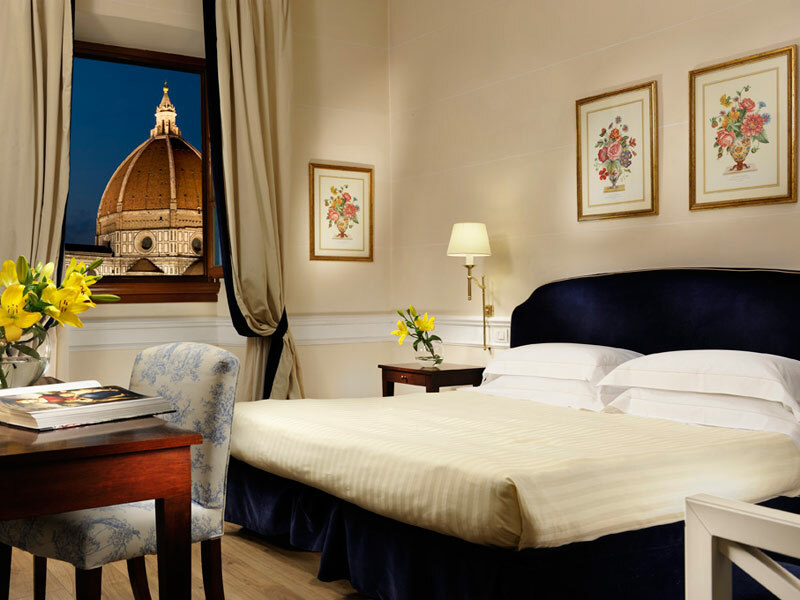 You have two options: go straight to a list of the best centrally located 4 star hotel in Florence to choose from, or read below for FWG's recommendations with more detailed descriptions. Hotel degli Orafi - top pick! 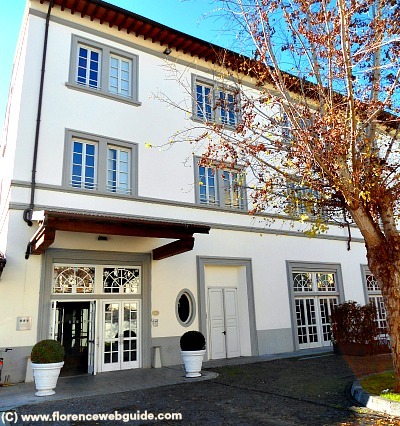 If you're looking for a fabulous 4 star hotel in Florence this one has it all! Hotel degli Orafi - literally meaning 'the goldsmiths' hotel' - offers a smack-dab-in-the-center location, great views, super friendly professional service, elegance and comfort and all at competitive prices to boot. The hotel is in the goldsmiths' quarter (hence the name) which is of course the Ponte Vecchio, which is just 10 minutes' walk from all the other main city sights, can't get better than that right? Rooms can be either traditional or modern style decor, and will be found spotless and newly refurbished. The breakfast spread is also tops, one of the most varied and plentiful in town with all sorts of savory and sweet options, all freshly prepared 'in house'. This 4 star hotel in Florence has a lot going for it. First, its fabulous location that is extremely central: just minutes to Duomo, station and newly refurbished Mercato Centrale as well as being just a short walk to all other places of interest. Want to relax at the end of the day? Here there is an on-site luxury health spa with Turkish bath and sauna as well as access to the finest gym in Florence, right next door (all included!). Getting a good night's sleep? No problem! Firenze Number Nine is on a pedestrian street so you won't have trouble with noisy traffic during the night (some rooms are even off a quiet courtyard with overlooking balcony). And then there's the service of course. You will be attended to by a professional competent staff (not stiff though, the workers here are very warm and smiley) who love helping their visitors appreciate Florence and navigate the city. This is the right place for you if you like modern decor rich in parquet floors, marble baths, stucco and frescoed ceilings and fine design furnishings. And, with only about 40 rooms, this accommodation is more boutique than large-scale luxury hotel. 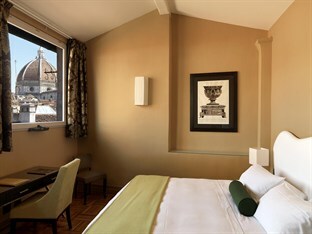 Hotel Calzaiuoli is a wonderful option for a four star hotel in Florence that is right in the heart of town. Via dei Calzaiuoli is considered the 'main drag' of Firenze, with some of the most popular shops and cafés right along the elegant street that leads into the beautiful Piazza Signoria, Florence's most important and spectacular square. Also a no-car pedestrian zone, this accommodation offers rooms that are peaceful and quiet in spite of being right downtown. With about 50 rooms, this is a medium-sized hotel with an elegant style, cozy feel and warm atmosphere. With all the modern conveniences, a rich breakfast buffet, and super handy location (you'll be just a 10 minute walk from all the main attractions!) Hotel Calzaiuoli is a winner. See Internet rates & reviews, read about the facilities and book your stay! Want to be central but not too much so? Hotel Roma is perfect then! Piazza Santa Maria Novella is literally minutes on foot from the station and all the most important sights, but is still a characteristic square that remains a bit 'off on its own'. 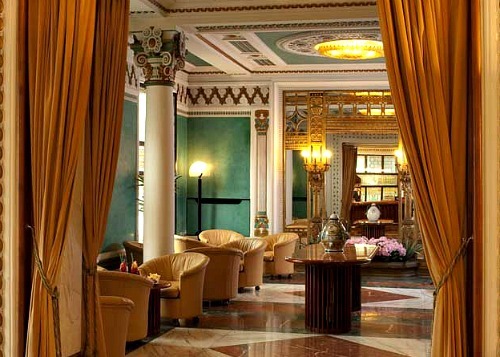 Located in an 18th century building, just around the corner from the historical 'Santa Maria Novella Perfumery', five minutes from the Duomo and surrounded by great cafès and restaurants, Hotel Roma offers a sophisticated and elegant ambience of antique wooden furniture and marble floors. The piazza is one of the city's oldest and still maintains a certain antique charm. 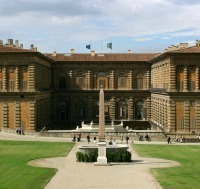 Thanks to its oval shape, this square is where the Medici used to run their horse races and jousts during the renaissance making this option a fine compromise for those who want a convenient location with a historical setting. 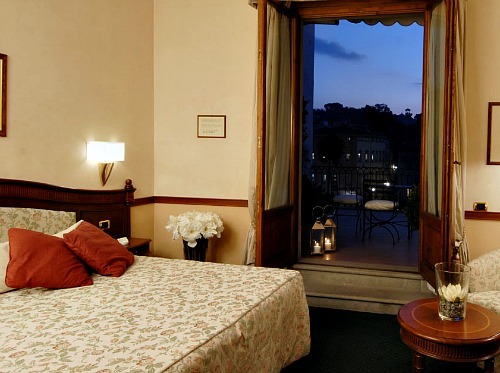 Hotel Una Vittoria is one of a kind. From the outside it looks like you're driving up to a country mansion in New Orleans, from the inside it looks like a modern night club! advantages: the area is so full of character and authentic, on the south side of the river but just barely outside the historic center, this is a real locals' neighborhood full of genuine shops, restaurants and artisan workshops. Absolutely lovely to walk from here to the main sights downtown. Hotel itself gets a 10 for its novelty and daring to combine a classic elegant exterior with a funky state-of-the-art interior design. Off the tourist route but just 20 minute walk to center. The AC Hotel by Marriott is one of Florence's newest and most modern Hotels. This global hotel group needs no introduction and provides the comfort of familiarity for members. about: extremely quiet side street location means undisturbed sleep from any room, plenty of free parking - this hotel is perfect for those who will travel by car since it is outside the off-limits driving area and requires no permit to come and go by auto. Ideal for people planning on taking day trips from Florence as access to motorway and highway are both very easy and quite close from here. 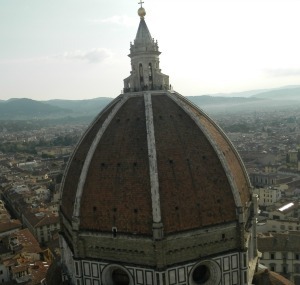 Yet, hotel remains a 20 minute walk to Duomo, and about 25 minutes to Ponte Vecchio. Mini-bus and tram are across street for those who prefer transport. 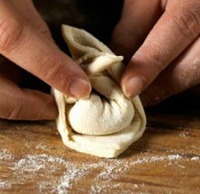 Find out more about Firenze....!